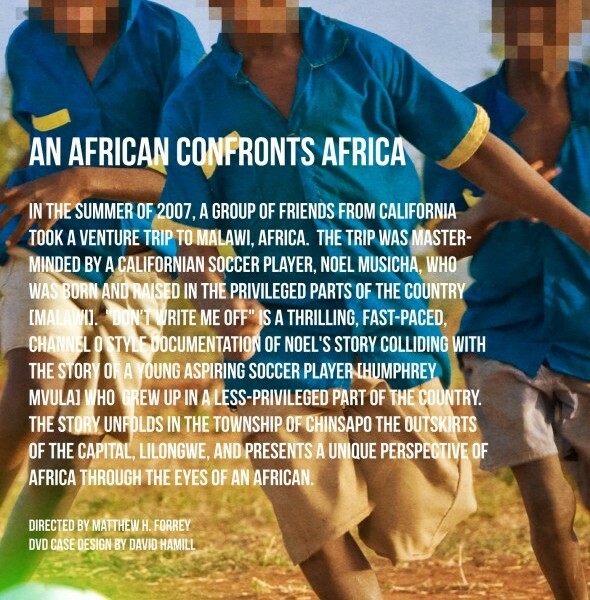 In the summer of 2007, a group of friends from California took a venture trip to Malawi, Africa. The trip was masterminded by a Californian soccer player, Noel Musicha, who was born and raised in the privileged parts of the country [Malawi]. “DON’T WRITE ME OFF” is a thrilling, fast-paced, Channel O style documentation of Noel’s story colliding with the story of a young aspiring soccer player [Humphrey Mvula] who grew up in a less-privileged part of the country. The story unfolds in the township of Chinsapo the outskirts of the capital, Lilongwe, and presents a unique perspective of Africa through the eyes of an African. DONT WRITE ME OFF Teaser from Matthew Forrey on Vimeo. *Set up a screening with your group of friends, at your school, at your church, etc.